Those early Irish saints seem to have been an astonishingly sedulous lot. When not rushing from one side of the country to another so as to convert any remaining pagans to Christianity, they were founding monasteries which, almost without fail, soon attracted thousands of followers. Such apparently was the case with Máel Anfaid (Mael the Prophet), a son of Cathal MacHugh, King of Munster and disciple of St Carthage, who in the first quarter of the sixth century like so many of his ilk diligently established a religious house. In this instance the spot chosen was an island called Dair Inis (Isle of the Oak) in the river Blackwater, County Waterford. Naturally the enterprise flourished and by the early 8th century Molana, as the island had been renamed, was a centre for the Céili Dé (the Servants of God), a reforming group determined to improve standards in the Irish church. Around the year 720 Molana’s Abbot, Ruben Mac Connadh in conjunction with Cu-Chuimne of Iona, produced the Collectio Canonum Hibernensis. This work laid out the rules of Canon Law, drawing on earlier texts and regulations, and was widely circulated throughout the rest of Europe over following centuries. Molana is also believed to have housed the first proper library in Ireland, although none of the original manuscripts is known to have survived. As usual, the Vikings were at fault: on their way upriver towards Lismore and other rich settlements they regularly caused havoc on Molana. By the 11th century these despoliations, plus flooding caused by the Blackwater being tidal at this stretch, had effectively obliterated Máel Anfaid’s once-thriving monastery. The island’s circumstances improved around the time of the arrival of the Normans. Nearby a castle was erected at Templemichael, possibly by the Knights Templar who would take care the adjacent monastery was not subjected to further attacks. Then this part of the country came under the authority of one of Strongbow’s knights, Raymond ‘le Gros’ FitzGerald, described by Giraldus Cambrensis as “very stout, and a little above the middle height…and, although he was somewhat corpulent, he was so lively and active that the incumbrance was not a blemish or inconvenience.’ Around this time the island was given to the Augustinian Canons who would remain there until the 16th century watching over the tomb of Raymond who died around 1186. The buildings were extensively reconstructed in the 13th and 14th centuries and once more the community thrived. However, again as was common throughout the country, the 15th century brought trouble, with the abbot John McInery accused of simony, perjury and immorality: Pope Nicholas V deposed him in 1450. By By 1462 it was reported that although the Augustinian friars were caring for many poor and sick their buildings were in poor condition. Perhaps for this reason that same year Pope Pius II granted an indulgence to pilgrims visiting Molana on certain feast days and offering forgiveness of sins to all who contributed towards its repair and upkeep. Come the 1540s and the Reformation, a crown report on the establishment stated it comprised a church, cloister and all that was necessary for the operation of agriculture including 380 acres of land, three weirs for catching salmon and a water mill, the whole having a value of £26 and fifteen shillings. Initially ownership of the island was given to James FitzGerald, 14th Earl of Desmond but following the family’s rebellion against the English authorities it was reclaimed by the English authorities. Molana was initially leased to an English sea merchant called John Thickpenny but a few years after his death in 1583 Queen Elizabeth granted it to Sir Walter Raleigh who owned adjoining land in Youghal. He in turn consigned it to his confidant, the astronomer, mathematician and ethnographer Thomas Hariot who it is sometimes said spent some time living on the island in what remained of the old monastery and working on various scientific theories. In 1601 Raleigh sold his entire Irish estate to that great adventurer Richard Boyle, future first Earl of Cork. A decade later Boyle gifted Molana and adjacent mainland of Ballynatray to his brother-in-law Captain Richard Smyth whose family would remain in residence there for some 350 years. The Smyths first built a castellated house but this was destroyed during the rebellion of 1641 and half a century later a Dutch-gabled building was erected on the same site. That was in turn replaced by the present house during the last decade of the 18th century. Designed by Alexander Dean of Cork the building is of eleven bays and two storeys over basement. Its situation with superlative views down river explain why at the start of the 19th century the Smyths decided to undertake work on Molana. First of all a causeway was constructed linking the island was to the mainland. This allowed ease of access to the picturesque ruins where certain structural changes were made, notably the insertion of a pointed arch entrance on the north side of the church. The building rightly dominates the site, measuring more than 55 feet with an undivided nave and chancel, the former being the oldest part of the building (12th century) and possibly incorporating an earlier church here. The 13th century chancel has ten large lancet windows, six to the south and four to the north, all almost thirteen feet high and concluding at the east end with a large window which still preserves fragments of the original decorated embrasure. To the immediate north is what remains of a two-story building, likely the prior’s residence, with a pointed doorway and spiral staircase. To the south-west lie the remains of the cloister at the centre of which a sculpture representing the monastery’s originator was erected. A plaque on the plinth below reads ‘This statue is erected to the memory of Saint Molanfidhe who founded this abbey for Canon Regular A.D. 501. He was the first Abbot and is here represented as habited according to the Order of Saint Augustine. This Cenotaph and Statue are erected by Mrs. Mary Broderick Smyth A.D. 1820.’ Elsewhere on the site and beneath a window another plaque was installed reading ‘Here lies the remains of Raymond le Gros, who died Anno Domini 1186.’ Old photographs show a funerary urn on the ledge above but this is no longer in place. Ballynatray – including Molana – has since changed hands on a couple of occasions but it is still possible to understand the place’s charm, not least when standing inside the house and looking upstream towards this romantic reminder of an ancient Irish saint’s sedulousness. Cloverhill House, County Cavan was shown here some months ago (see A Mere Shell, 9th September 2015), a ruin well on the way to vanishing altogether. Happily its entrance is in better condition, a slim, unadorned ashlar triumphal arch flanked by pedestrian gates. The residnce to which it originally gave access was extended by Francis Johnston in 1799, so one imagines the arch dates from the same period. The side gates need to be cleared of overgrowth if they are not to go the way of the old house. Reference was made here some weeks ago to the Board of First Fruits (see Made Better by Their Presents II, December 12th 2015). Although it had a considerable impact on the Irish landscape in the 18th and early 19th century, this organization is today little known. To reiterate briefly, the board was established in 1711 to provide financial assistance for the building and improvement of the Church of Ireland’s places of worship and glebe houses. First funded by a tax on clerical incomes from 1778 onwards it received grants given by the Irish Parliament, after 1785 this being a yearly sum of £5,000. Following the Act of Union, this country’s Anglican clergy became absorbed into the newly-formed United Church of England and Ireland and thereafter the amount of money made available to the Board of First Fruits rose: its annual grant doubled to £10,000 in 1808, soared to £60,000 between 1810-16 before dropping first to £30,000 and then £10,000 after 1822. As a result of this money, the Church of Ireland was able to embark on a building spree: in the first quarter of the 19th century almost 700 churches were either newly constructed or renovated, along with 550 glebes and 172 schoolhouses. While the entire country benefitted from this programme, there were regional variations depending on the level of engagement by whoever was then in charge of a diocese. Among the most committed to the scheme was Thomas Lewis O’Beirne, Bishop of Meath for a quarter-century (1798-1823). O’Beirne is a fascinating character. Born into a Roman Catholic family in County Longford, initially he studied for the Catholic priesthood at the Jesuit seminary in St Omer, France: his younger brother Denis was there at the same time and completed his studies (the siblings would later serve in the same parish of Templemichael, Longford, Thomas as rector and Denis as parish priest). A breakdown in health led Thomas to England where he converted to Anglicanism and attended Trinity College, Cambridge. Highly intelligent, industrious and devotedly loyal to the Church of Ireland, he was appointed first to the Diocese of Ossory in 1795 before being transferred to Meath three years later. During his long episcopate, he embarked on an improvement of both clergy and buildings in the diocese, a schedule of work which has been thoroughly investigated by Mary Caroline Gallagher in her 2009 doctoral thesis on the subject. Exhibiting the customary fervour of the convert, O’Beirne believed incumbents ought to be resident in their parishes (not something which had hitherto been universally the case) and services should be held in churches that were structurally sound and, appropriately designed and maintained. Hence his keen interest in improving both clergymen’s homes and places of worship. He was fortunate in his timing, his period as Bishop of Meath coinciding with the Board of First Fruits having most money to distribute, commonly through a mixture of grants and loans to parishes (which on occasion had the effect of saddling parishioners with long-term debt). Today we look at two Meath churches that underwent redevelopment in O’Beirne’s time. The first of these (top and above) is St Patrick’s at Castletown-Kilpatrick. There was a mediaeval church on this site and parts of it were incorporated into the newer building, in particular over the east window a portion of what is believed to be a 15th century tomb stone showing a woman in prayer. There are also two old arched windows on the second floor of the belltower and a stone head that projects from the wall of the church. These were presumably rescued by the man responsible for the building’s refurbishment, whose name features in a stone plaque over the doorcase (which also looks to be older than the main body of the church). The plaque reads ‘This Church was Rebuilt by Order of The Rigt. Honb. & Rt. Revd. Th. Lewis Lord Bishop of Meath. The Revd. Robt. Longfield Rector. Henry Owens Esqr. & Henry Liscoe, ChurchWardens. Robt. Wiggins Builder. A.D; 1820.’ The cost of the project was £467 and four years later a glebe house was also constructed to the immediate south at a cost of £1,107, this work financed by a Board of First Fruits loan. Declining numbers of worshippers meant that by the third quarter of the last century it had become difficult to sustain the church, which closed for services in the mid-1960s. The glebe house had already been sold and demolished around 1945. Viewing an old building, one is often so engaged absorbing the totality that details of design can be overlooked. How many visitors to Ballyvolane, County Cork, for example, pay much attention to the stairs? This house, originally built in 1728 by Sir Richard Pyne, was extensively modified in the second half of the 1840s by a descendant, Jasper Pyne. Evidently a new staircase was one of his additions but note how on the side of every tread is affixed a cast-iron putto in each of whose fists can be found a nail holding one of the balusters in place. The above oil, painted in Constantinople in 1740 by Jean-Étienne Liotard, features in a marvellous exhibition devoted to the Franco-Swiss artist running until the end of the present month at the Royal Academy, London. The sitter was the Anglican clergyman Richard Pococke, then on an extended Grand Tour lasting more than eight years. Pococke’s travels took him not only around Europe but also to Egypt, Palestine, Lebanon & Syria, Asia Minor, and Greece: fortunately his full correspondence (predominantly letters sent to his mother, always addressed as ‘Honoured Madam’) from this period has been edited and published in three volumes in recent years by Dr Rachel Finnegan and is much recommended. From these we learn of Pococke’s meetings in 1740 with Liotard who was then resident in Constantinople, hence in this picture Pococke is represented in oriental costume (a fashion which the artist did much to promote when he returned to Europe). From 1747 onwards Pococke spent increasing periods of time in Ireland where his restless spirit directed him on several journeys around the country: his published tour of 1752 is also compelling reading. He was appointed Bishop of Ossory in 1756 and then of Meath in 1765 but died only a matter of months after assuming the latter office. His memorial in the graveyard of Ardbraccan, County Meath can be seen below. As mentioned, the Liotard exhibition is unquestionably worth seeing, not least for its strong Irish interest since he had many patrons in this country including Simon Luttrell, first Earl of Carhampton, the Earl of Clanbrassil and above all William Ponsonby, second Earl of Bessborough who had first invited Liotard to accompany him to Constantinople. Do not attempt to adjust your screens: the tilt is real. This is the 10th century round tower in Kilmacduagh, County Galway, at some 111 feet the tallest such structure in the world. The conical cap, which unusually overhangs the drum, collapsed in 1858 and was rebuilt almost twenty years later. The tower has a circumference of fifty-six feet and walls six and a half feet thick. In addition, Kilmacduagh’s round tower has the greatest number of windows – eleven, all angle-headed – and a doorway almost twenty-three feet above the ground, leading to questions about how anyone ever gained access: the height is too great for a solid ladder and the alternative would be a rope ladder of exceptional length. But most extraordinary of all, the tower leans over a foot and a half to the south-west. At the start of the 7th century Colman MacDuagh who had hitherto been living as a hermit on the Burren, was persuaded by his cousin Guaire Aidne mac Colmáin, King of Connacht to establish a monastery in this part of the country. Legend has it that while Colman was walking through woods in the area seeking a spot for the new foundation, his girdle fell to the ground. Taking this as a divine omen he chose the place for his monastery. The girdle is said to have been studded with gems and kept for centuries by the O’Shaughnessys, descendants of King Guaire, and then by another branch of the family the O’Heynes. It has long since disappeared but an additional item associated with Colman, his supposed crozier (although likely of later manufacture) which was credited with the power to make a thief restore stolen items, is now in the National Museum of Ireland. The fame of Saint Colman (as he became after his death in 632) attracted many followers and the monastery at Kilmacduagh thrived for several centuries. Indeed such was its importance that in the 12th century Kilmacduagh became the centre of a new diocese (subsequently merged with Galway). However like so many such establishments in Ireland it was subject to frequent attacks. The buildings were plundered several times before finally being devastated at the start of the 13th century by the Norman knight William de Burgh during his conquest of Connacht. At some date before his death in 1253 Owen O’Heyne founded the nearby house of St Mary de Petra for Augustinian canons. They remained here until the Dissolution of the monasteries in the 16th century after which the lands of Kilmacduagh were granted to the Richard Burke, second Earl of Clanricarde, a descendant of William de Burgh. Today the remains of sundry buildings from different dates can be found on the site including the cathedral, the friary of St Mary de Petra, churches dedicated to John the Baptist and the Virgin and the former glebe house as well as the world’s tallest, and only leaning, round tower. 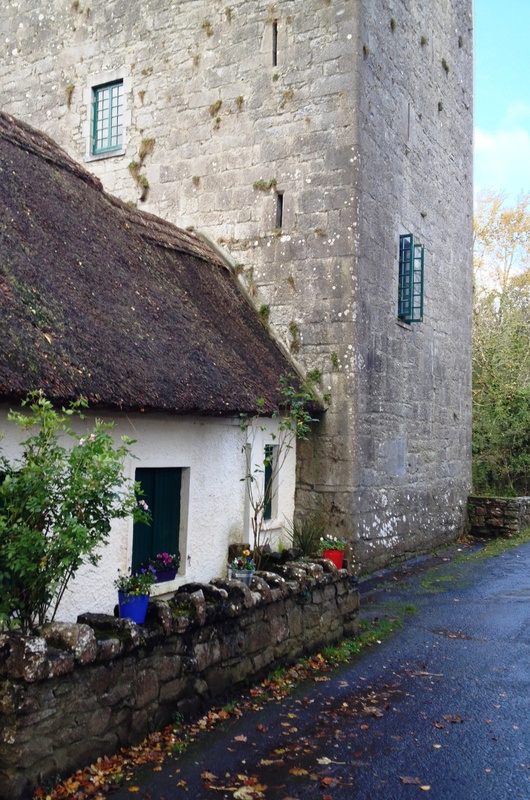 Thoor Ballylee, County Galway is a 15th/16th century tower house originally built by the de Burgo family but now best known as the former property of poet William Butler Yeats who acquired it a century ago and subsequently undertook a restoration of the old building. Opened to the public in 1965, the tower closed seven years ago after being flooded by adjacent Streamstown river. It might have remained shut thereafter but for the endeavours of a local group, the Yeats Thoor Ballylee Society, which tirelessly worked for the building’s refurbishment in time for last year’s 150th anniversary of the poet’s birth. These pictures were taken two months ago, since when the tower – like so much of the surrounding country – has once more been subjected to severe flooding. However, according to the society’s website (http://yeatsthoorballylee.org) determined efforts are being made to ensure it will reopen later in the spring: an example of local, private initiative that deserves to be applauded and emulated elsewhere.